In my last post, I said I was going to try to post soon afterward, so I'm counting this two-week gap as "soon." Of course, I am aware it is March now, but at least only the 2nd. After recapping my recent 5k, I mentioned that a half-marathon is in my near future -- in fact, this Sunday. I also mentioned that a number of issues made my 5k harder than it should be, namely, a bad cold followed by a rib muscle sprain. Unfortunately, it gets worse. I pulled another rib muscle, on my other side. While the original offending side is healing slowwwwly, this new one got way worse a couple of days ago when I sneezed. Yep, I've done so many races and bounced back from Cesarean section, only to get blown out by a sneeze. My entire upper ab/chest cavity is out of commission. It's a tough pain to describe to someone who has not had this unfortunate injury of sorts, but basically, I can't even do a plank now without great pain. Lower body stuff is mostly fine (more on that later), but while I can still do a little upper body weights (very very carefully), even breathing hurts sometimes, and so my physical activity has been pretty limited. I can do some HIIT as long as it's not anything that makes me do a plank and run without swinging my arms too much. In both of these, I'm limited to a moderate intensity so I don't stress the rib muscles (intercostal muscles, technically) by breathing too hard. Lower body weights are fine, upper body weights -- touch-and-go, but in everything, I have decreased the weights by at least 20%. This is a bummer, and even moreso because I'm fairly certain I am logging in my first "DNS" (did not start) this weekend. There is just no way I want to push through a half-marathon that I didn't train for (well, I DID train for it on its original date, see here for more on that) with so much pain. I tried going out this morning for a run, and it was riddled with pain if I pushed at all. That pretty much sealed the deal for me. I'd rather just heal up and return to my normal activities sooner than later. I have some much internal strife about this -- the cheapskate in me wants to "use" my race fees. Well, I'll at least pick up the "swag" and do an update post on it later. My younger self is just frustrated at my wanna-be mature decision of sitting this one out. And hopefully, when I DO run that 30th half-marathon, it will be when I'm in a better state. Anyway, onto some BETTER news. I started a YouTube channel! 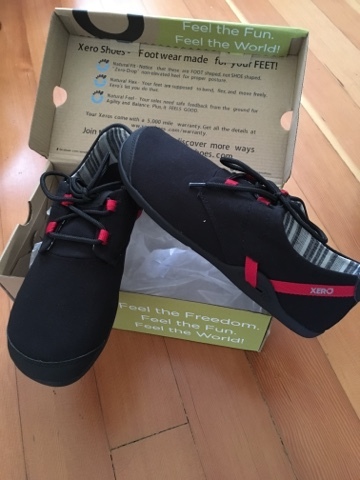 Now, I mainly did this so I could do a quick video on the new Xero Shoes I received so I could help them out with marketing them, but it IS an idea I've toyed with for a while. I mean, let's face it -- blogging is becoming a little less consumable than it used to be, and I don't know about you, but I love seeing things on video. This doesn't mean I won't be blogging anymore, but I think that if I decide to keep posting there, I will be putting out more "stuff" in general, which I think is a good thing. I would say something like "Let me know what you think," but I am perfectly aware that my maiden voyage video was filmed quickly on my iPhone in all my frumpy glory. If this becomes a thing, I will need to start cleaning up a bit, I guess! Below is my written review of the new Xero Shoes. If you recall, this company makes shoes that are more amenable to you "feel[ing] the world" when you're wearing them, so you're not going to find a whole lot of clunky materials so that your feet can kind of just do their thing. I reviewed the Hana shoes a few months back and still wear them VERY often as a go-to shoe that I slip on when I go out, chase my kid around, etc. I also reviewed the Umara sandal, which is my summer go-to for the same reasons. The Lena is the women's version of the Hana, so it's pretty similar, just a bit more feminine-looking. I feel like it's more narrow, too, or maybe it's because I've worn down the Hanas too much. Although its sole is minimal, I really enjoy walking in them, even over longer distances. I'll be wearing them in this weekend when I'm... not doing a half-marathon. I was also sent the Prio to review, which is more of a running-style shoe. When I put this on, I could feel it was very different than the Lena... definitely more of a running shoe, though still minimally cushioned. I did some strides in them and felt fine. I've admittedly run around in my Hanas, so I could definitely go quite a while in these. I will most likely use these when I'm running on the treadmill. 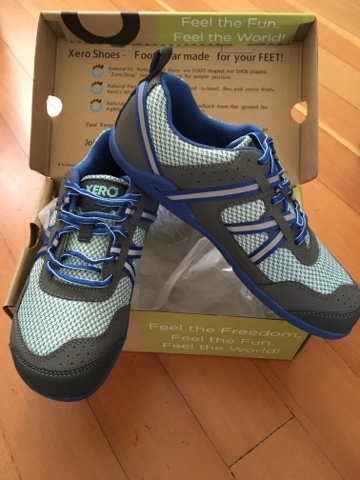 FTC Disclaimer: I was sent samples of Xero Shoes to review but was not otherwise compensated to provide a particular opinion. My opinions are my own. I like the video. Can I suggest you turn your camera to the side instead of lengthwise so the video can be viewed larger? Would also be good to have the camera at a more natural level instead of lower. Otherwise, I think you have great camera presence! Thanks! It was definitely a quick record on my iPhone. I do have bigger guns to pull out, but we'll see how often I do them. They say the best camera is the one you'll have on hand... not sure if that applies to YT but we'll see. A Case of the "Did Not Start"